Malnutrition is not restricted to third world countries – there is plenty in North America. David Barker MD PhD FRS was a physician, Professor of Clinical Epidemiology at the University of Southampton, UK, and Professor in Cardiovascular Medicine at Oregon Health and Science University, USA. Twenty-five years ago he showed for the first time that people who had low birth weight are at greater risk of developing coronary heart disease and diabetes. This is now widely accepted. It has led to a new understanding that chronic adult diseases are “programmed” by malnutrition in the womb. Dr. Barker’s work is relevant around the world. In the Western world many babies are malnourished because their mothers eat diets that are unbalanced and monotonous, or because their mothers are either overweight or excessively thin. In the Third World many babies are malnourished because their mothers were chronically undernourished when they were young. When you educate a Mom – you educate a family. Simply put – by feeding our daughters properly from the moment they are born – we are setting the stage for our grandchildren’s health. So you are not mothering just your daughter – you are mothering your grandchildren. We know that by feeding our daughters properly from the time they are born – we are setting the metabolic stage so to speak for our grandchildren. 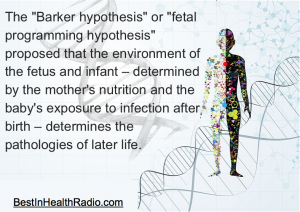 Dr Barker has lectured and written extensively on nutrition in the womb and its life-long consequences. He has received a number of international awards including the Danone Nutrition Award, the Prince Mahidol Prize and the Richard Doll Prize. We pledge to keep the work of Dr. Barker alive. An Incredible, approachable, brilliant, lovely man.